First birthday parties and pups? They're a truly big thing, for many people. Either you're buying your baby barker a special made-for-dogs dessert for his own first birthday, or you've created a dog-focused theme for your human tot's first big bash, down to the cute tablecloth, plates, and napkins. What if, though, you could go to a first birthday party and possibly meet a pooch you'll want to live with forever and always? It feels like the perfect match-up, between tail-waggers and a major milestone, and the ideal way to mark a first birthday. Which is just what Wags & Walks will do on the afternoon of Sunday, Jan. 27. 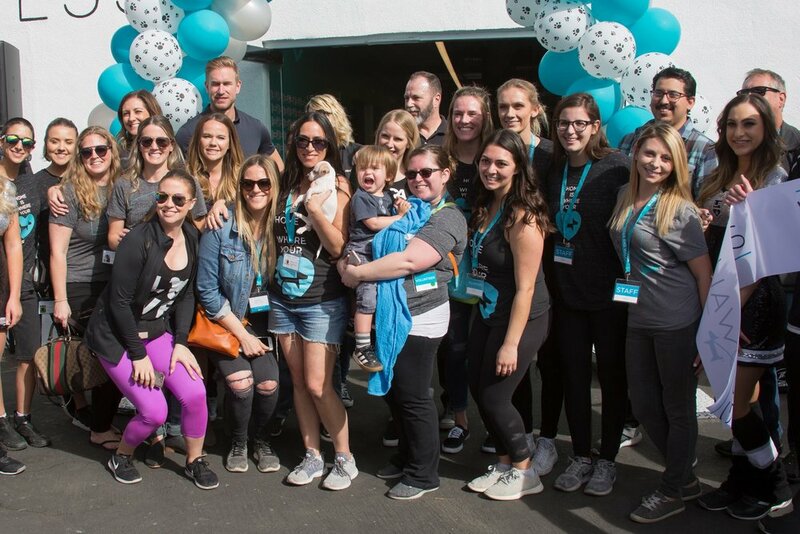 Megan and her husband, Jeff Carter, who plays centerman for the Los Angeles Kings, have been involved with animal rescue and advocacy for the majority of the time they’ve lived in the South Bay—beginning with Megan’s early volunteer work with shelter and rescue group NKLA (No-Kill Los Angeles). Their involvement with West L.A.-based Wags & Walks started in 2013 when the company was still in its infancy and working in founder Lesley Brog’s garage in West Los Angeles. To date Wags & Walks has saved more than 4,000 dogs, a statistic they proudly display on their homepage. These 2 Dogs Were Trapped in an L.A. River Sewer and Covered With Fleas – Now They Look Like Brand New Pups! Thanks to two amazing and compassionate teenagers, not one but two homeless dogs were recently rescued by Hope for Paws. The kids made the life-saving call after they heard dogs crying in a sewer near the L.A. River. They waited with the two Westie mixes until Eldad and Loreta arrived at the location. The rescuers climbed the wall to the sewer below and managed to gain the pups’ trust with a little bit of food. Loreta was able to place lucky leashes around their necks, and soon the duo was named Winn and Dixie! After being checked for microchips, Winn and Dixie were treated for fleas, eye infections, and of course, they got a nice, warm bath. These two were so sweet they found a forever home shortly after going into foster care with Wags and Walks. Now, they are so happy, healthy, and loved – talk about going from rags to riches! It isn’t a store or a breeder: it’s Los Angeles-based dog rescue Wags and Walks. This dog rescue knows that the country is full of family-friendly, adorable dogs who need a little help finding their perfect matches. So far, Wags and Walks has helped place more than 38,000 dogs of all breeds, ages, shapes and sizes in loving homes. And some of those homes happen to be celebrity abodes. Wags and Walks has adopted out to stars like Paris Jackson and Tom Brady, and the rescue also fostered Ginger the pit bull to Sir Patrick Stewart — a special relationship that captured the hearts of animal lovers all over the world. KISS Front man Gene Simmons and his wife Shannon Lee Tweed Simmons made a surprise visit to local Los Angeles dog rescue Wags & Walks on Tuesday June 19th 2018. Their visit was to help raise awareness about dog rescue and deliver hundreds of toys and treats to loving dogs in need of homes. The toys and treats were provided by iHeartDogs.com. Founded in 2011, Wags and Walks' goal is "to promote and save as many shelter dogs as possible and promote them as the most family-friendly dogs in the world," says founder Lesley Brog, who started the organization — which has saved 3,800 dogs to date — out of her home. Transporting animals to shelters where kennel space is plentiful and demand for adoption is high is one approach to saving lives in high-density, urban environments that struggle with animal homelessness—like Los Angeles. Too often, dogs in shelters are euthanized simply due to lack of shelter space when, often times, many of these animals would be quickly adopted in other states or parts of the county. The LA Kings have partnered with Wags and Walks and have generously supported this deserving rescue. A local dog rescue group is about to open a new adoption center in West Los Angeles. FOX 11's Matt Johnson reports. Been to a bark-tastic, cuddle-kissy, snout-sweet adoption festival in the past few years? You may have seen Wags & Walks there, or at other locations around the region, like The Original Farmers Market at Third & Fairfax. The nearly 7-year-old rescue organization has gone to many places around Southern California to match many happy humans with home-needing hounds, but there hasn't yet been a main adoption center for the busy group of animal supporters. Unlike many other animal rescue groups, Wags and Walks saves dogs of all sizes, ages and breeds. Based in Los Angeles, this nonprofit was founded in 2011 by Lesley Brog, to help decrease the number of dogs euthanized in shelters. Since its inception, Wags and Walks has saved the lives of more than 2,000 rescue dogs. In 2016, the group saved 787 dogs and found forever homes for 735 pooches. One of the most heartwarming animal charities out there, all donations go towards helping rescue homeless dogs from shelters and providing them with medical care, food and boarding. Paris Jackson cuddled up to a sweet pooch at the 7th Annual Wags and Walks Gala in Beverly Hills on Saturday, September 16. Click here for link to Us Weekly. Hollywood couple and former Revenge co-stars Emily VanCampand Josh Bowman, who got engaged in May, just gave an adorable Rescue dog a forever home. On Friday, the 31-year-old actress hopped on her Instagram to share the furry news with the world that the twosome had added a four-legged friend named Frankie B. to their fam. 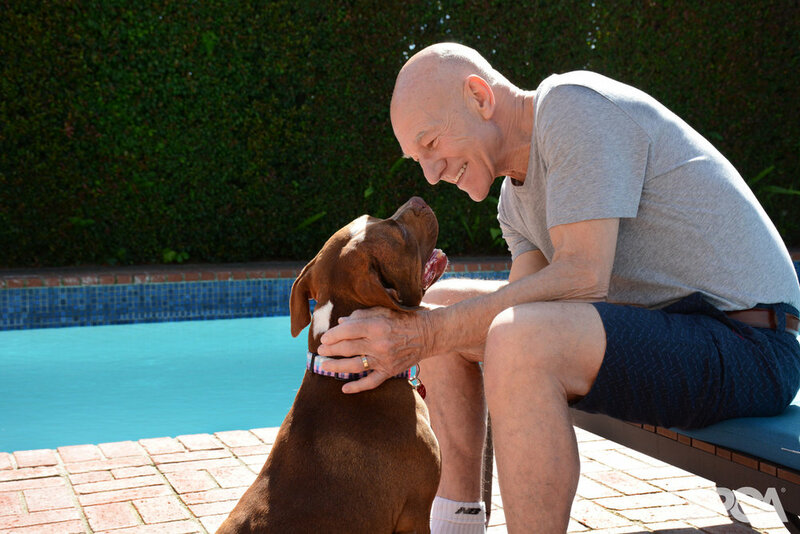 Sir Patrick Stewart has a new role, and we think it's his best one yet: He's now the foster dad to a pit bull named Ginger. On Wednesday, Ginger came to live with Stewart and his wife, the musician Sunny Ozell, at their home in Los Angeles. Ginger and Patrick were also featured in Vanity Fair, People, Mashable and The Animal Rescue Site.org! As welcoming as West Hollywood is, it can often be a challenge for even the most outgoing of folks to meet people when moving into a new neighborhood. Why not consider volunteering your time with the local animal rescue organization? It is a great place to meet fellow pet-lovers while serving your community. 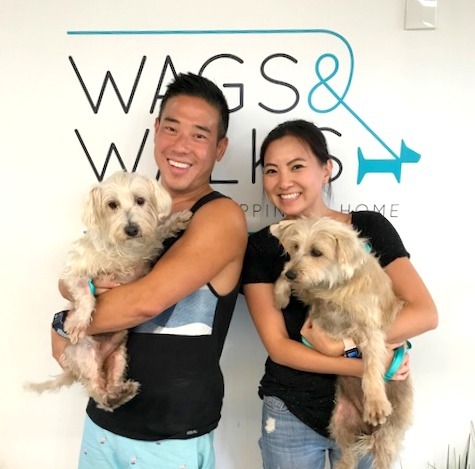 Wags and Walks is a great West Hollywood-based rescue organization that works to pair dogs with future guardians based on home, family and lifestyle. They have monthly adoption events at The Original Farmers Market and The Dog Bakery. Don’t have time to commit to volunteer work? Check out their events calendar for monthly pet-centric fundraising and social functions. Featuring George Lopez with Wags & Walks alumnus Pippa! Click for full article here. The holidays can be a confusing time for your pets...trees, shiny ornaments, candles, and extension cords - all create hazards. Dr. Jeff Werber is here with some friends from Wags and Walks Rescue to help keep your pets safe. Seven contestants from the popular ABC franchises "The Bachelor" and "The Bachelorette" will play WHO WANTS TO BE A MILLIONAIRE during Bachelor Fan Favorites Week, airing MONDAY, NOVEMBER 28 - FRIDAY, DECEMBER 2, 2016. Bachelor Fan Favorites is one of "Millionaire"'s most popular theme weeks and host Chris Harrison will reunite with memorable contestants from the romance reality series, all playing to benefit their favorite charities. These dogs lived in deplorable conditions with such little human interaction. They are loving and affectionate and ready for adoption! For News Cast Click here. George Lopez met his 1-year-old Chihuahua Owen when he was hosting the World Dog Awards. Owen had been rescued by Wags and Walks, but no one had given him a permanent home. Earning a woof of approval! Maria Menounos threw her dog Baby a Sweet 16 birthday party on Sunday, July 10, while wearing the most summery A-line skirt. The E! host, 38, modeled the hot-pink, floral-print Rose Crista Skirt from Kate Spade New York's Madison Ave. Collection ($548, katespade.com). (It also comes in a black-and-white rose print.) Menounos teamed the ultra-femme piece with a sleeveless white crop top, metallic sandals and a wide-brimmed black hat. Peter Facinelli poses with a pup Friday at the Wags And Walks Muttin' But Love gala in Beverly Hills, California. Do yourself a favor and find Dane Cook on Instagram. The funnyman adopted a puppy in February, and since then, Dane's Instagram account has been riddled with absolutely adorable pictures of the little guy, named Chopper. The German Shepherd and Poodle mix came from LA shelter Wags and Walks, and the pup has clearly already burrowed into Dane's heart. Dane shares photos of their life together on Instagram, including their hikes at Runyon Canyon and playtime at home. Scroll through to see arguably one of the cutest dog/owner pairs ever, and then check out Tom Brady and Gisele Bündchen's dog, Fluffy, also adopted from Wags and Walks. It's time to let the puppies do the talking...well kind of! This Sunday before the Oscars 2016, we're enlisting 10 puppies to help us predict the Best Picture winner. During E! 's Countdown to the Red Carpet: The 2016 Academy Awards starting at 1:30 p.m. ET / 10:30 a.m. PT, we'll have a course set up with treats leading to each of the eight Best Picture nominees. After two minutes whichever film attracted the most puppies wins the puppy prediction! Gisele Bündchen and Tom Brady's family has just grown…with the addition of another fur baby! The couple surprised their two children with Fluffy, a precious black-and-white pup that they adopted from Wags and Walks, a dog rescue in Los Angeles. The organization saves dogs from kill shelters and places them in "loving forever homes." So yes, Gisele and Tom are beautiful and goodhearted. The Brady family added an adorable rescue pup named Fluffy to their brood and the little guy got the royal treatment on Tom’s Facebook page. Gisele Bundchen posted the photo of the adorable, black and white pup Fluffy to her Instagram on Wednesday. "Thank you @wagsandwalks for all you do and for letting us rescue this little angel. The kids are over the moon with our new family member. Fluffy is pure joy!" she wrote in the caption. And on Thursday, Brady uploaded a video reenacting the "Circle of Life" with the little dog. Leave it to a supermodel and a NFL heartthrob to find the cutest puppy ever! Gisele Bundchen and Tom Brady welcomed a rescue dog into their beautiful family, and it's clear that they're already experiencing some serious puppy love. "Thank you @wagsandwalks for all you do and for letting us rescue this little angel," Bundchen, 35, captioned a pic of the pup on Wednesday. "The kids are over the moon with our new family member. Fluffy is pure joy!"